2 MATCHED PAIRS, Professional Quality Tool! 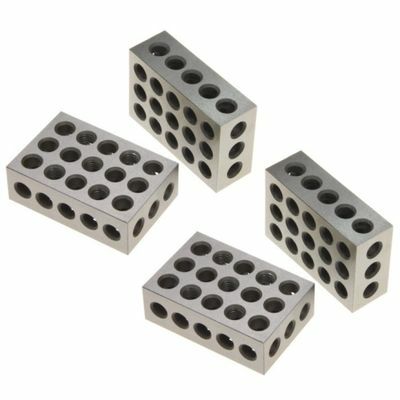 Hardened and precision ground 1" x 2" x 3" Block Set. This matched pair of blocks is ground to tolerances of .0001". 23 holes (5 tapped 3/8"-16 TPI and 18 plain). Includes 2 matched pairs (4 blocks). WE SHIP FASTER and SAFER THAN MOST SELLERS! We stock all available items, and we ship from our warehouses. We never use drop shipping. Most orders are shipped the same or next business day after payment received. We ship with UPS ground or with the US Postal Service at our discretion. Some items may be shipped to PO Boxes, Please inquire before bidding. Please inquire before buying/bidding for shipping to AK, HI, PR, VI, GU, MP, APO/FPO or PO Box with city, state and zip code. Rate may be higher or shipping is not available at all. Buyer assumes all risk of liability with respect to the purchase and use of the product/item. All of our pictures are photos of actual items. Colors or packaging of items delivered may vary from those photographed Payment is expected within 5 days of auction close. We can not guarantee availability of product if we do not receive payment within 7 days. Buyer is responsible for all shipping charges. We must collect sales tax if item is shipped to a California address.